For other uses, see Flower garden (disambiguation). Flower gardens combine plants of different heights, colors, textures, and fragances to create interest and delight the senses. A flower garden or floral garden is any garden where flowers are grown and displayed. Because flowers bloom at varying times of the year, and some plants are annual, dying each winter, the design of flower gardens can take into consideration maintaining a sequence of bloom and consistent color combinations through varying seasons. Besides organizing the flowers in bedding-out schemes limited to annual and perennial flower beds, careful design also takes the labour time, and the color pattern of the flowers into account. 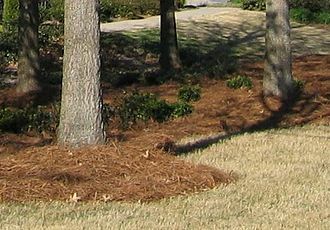 The labour time can be decreased by using techniques such as mulching. 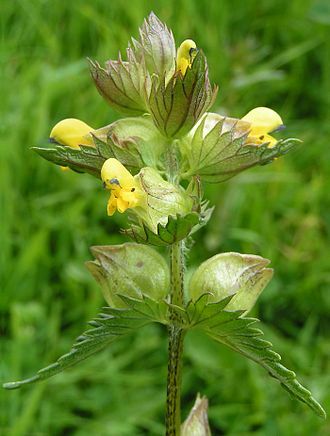 In flower meadows, grass growth can be moderated by planting parasitic plants such as Rhinanthus. Flower color is another important feature of both the herbaceous border and the mixed border that includes shrubs as well as herbaceous plants. Flower gardens are sometimes tied in function to other kinds of gardens, like knot gardens or herb gardens, many herbs also having decorative function, and some decorative flowers being edible. A simpler alternative to the designed flower garden is the "wildflower" seed mix, with assortments of seeds which will create a bed that contains flowers of various blooming seasons, so that some portion of them should always be in bloom. The best mixtures even include combinations of perennial and biennials, which may not bloom until the following year, and also annuals that are "self-seeding", so they will return, creating a permanent flowerbed. Another, even more recent trend is the "flower garden in a box", where the entire design of a flower garden is pre-packaged, with separate packets of each kind of flower, and a careful layout to be followed to create the proposed pattern of color in the garden-to-be. Many, if not most, plants considered decorative flowers originated as weeds, which if attractive enough would sometimes be tolerated by farmers because of their appeal. This led to an artificial selection process, producing ever-prettier (to humans) flowers. This is thought to have occurred for the entire history of agriculture, perhaps even slightly earlier, when people tended to favor naturally occurring food-gathering spots. This may also explain why many flowers function as companion plants to more useful agricultural plants; they had evolved that symbiotic relationship with the food plants before either was domesticated, and therefore was found in the same area, convenient to be selected as an attractive plant. Once domesticated, though, most flowers were grown either separately or as part of gardens having some other primary function. In the West, the idea of gardens dedicated to flowers did not become common until the 19th century, though in fact many modern gardens are indeed flower gardens. Flower gardens are, indeed, a key factor in modern landscape design and even architecture, especially for large businesses, some of which pay to have large flower gardens torn out and replaced entirely each season, in order to keep the color patterns consistent. A functional garden used to grow flowers for indoor use rather than outdoor display is known as a cutting garden. It is usually only a feature of large residences. The cutting garden is typically placed in a fertile and sunlight position out of public view and is not artistically arranged, as it contains flowers for cutting. The cutting garden may comprise a herb garden and ornamental vegetables as well. ^ "Eén - Groenland - Natuurlijk aangelegde tuinen - Eén". 26 June 2015. ^ "Natuurtuinen door Groenvoorziening Geys te Mol". www.natuurtuinen.be. ^ "Het ratelaar-experiment - de theorie - AnneTannes Tuin". annetanne.be. ^ Dishan, Varun (10 January 2018). "Selecting and growing flowers for all seasons". Flowers N Fruits. Retrieved 27 June 2018. Wikimedia Commons has media related to Flower gardens. A weed is a plant considered undesirable in a particular situation, a plant in the wrong place. Examples commonly are plants unwanted in human-controlled settings, such as fields, lawns. Many plants that people widely regard as weeds are grown in gardens and other cultivated settings. The term weed is applied to any plant that grows or reproduces aggressively, Weed control is important in agriculture. Methods include hand cultivation with hoes, powered cultivation with cultivators, smothering with mulch, lethal wilting with high heat, certain classes of weeds share adaptations to ruderal environments. The nature of the habitat and its disturbances will affect or even determine which types of weed communities become dominant. In contrast, perennial weeds often have underground stems that spread under the surface or, like ground ivy, have creeping stems that root. In locations where predation and mutually competitive relationships are absent, weeds have increased resources available for growth and these chemicals may limit the growth of established plants or the germination and growth of seeds and seedlings. A number of native or non-native plants are unwanted in a location for a number of reasons. An important one is that they interfere with food and fiber production in agriculture, other important reasons are that they interfere with other cosmetic, decorative, or recreational goals, such as in lawns, landscape architecture, playing fields, and golf courses. Similarly, they can be of concern for environmental reasons whereby introduced species out-compete for resources or space with desired endemic plants, in weed ecology some authorities speak of the relationship between the three Ps, place, perception. These have been variously defined, but the weed traits listed by H. G. Baker are widely cited. Weeds have long been a concern, perhaps as long as humans have cultivated plants, and the Bible, Cursed is the ground because of you, through painful toil you will eat of it all the days of your life. It will produce thorns and thistles for you, and you eat the plants of the field. By the sweat of your brow you will eat your food until you return to the ground, While the term weed generally has a negative connotation, many plants known as weeds can have beneficial properties. Sustainable gardening includes the more specific sustainable landscapes, sustainable landscape design, sustainable landscaping, sustainable landscape architecture, resulting in sustainable sites. Organic gardening and the use of plants are integral to sustainable gardening. On Sustainability in Horticulture and a Declaration for the 21st Century, the principles and objectives outlined at this conference were discussed in more practical terms at the following conference at Seoul in 2006. These practices were established as movements for self-sufficiency and small-scale farming based on a systems approach. Included here would be, biodynamic agriculture, no-till farming, Fukuoka farming, forest gardening, organic gardening and others. On a larger scale there is the more recent whole farm planning which was established in 1995, and ecoagriculture established in 2000, managing global biophysical cycles and ecosystem services for the benefit of humans, other organisms and future generations has now become a global human responsibility. The method of applying sustainability to gardens and sites is still under development, there are a number of basic and common underlying biological and operational principles and practices in the sustainable sites literature. Sustainable management of man-made landscapes emulates the natural processes that sustain the biosphere and foremost is the harnessing the energy of the Sun and the cycling of materials thereby minimising waste and energy use. The use of plants in a garden or landscape can both preserve and protect natural ecosystems, and reduce the amount of care and energy required to maintain a healthy garden or landscape. Native plants are adapted to the climate and geology. Native plants support populations of birds and other animals that they coevolved with. 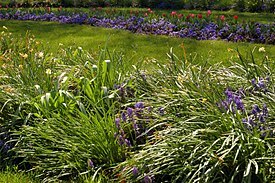 Plants in a garden or maintained landscape often form a population from which plants can colonize new areas. Avoiding the use of invasive species helps to prevent such plants from establishing new populations, the use of native species can provide a valuable source to help these plants colonise new areas. An arboretum in a narrow sense is a collection of trees only. Related collections include a fruticetum, and a viticetum, a collection of vines, more commonly, today, an arboretum is a botanical garden containing living collections of woody plants intended at least partly for scientific study. An arboretum specializing in growing conifers is known as a pinetum, other specialist arboreta include saliceta and querceta. The term arboretum was first used in an English publication by John Claudius Loudon in 1833 in The Gardeners Magazine, egyptian Pharaohs planted exotic trees and cared for them, they brought ebony wood from the Sudan, and pine and cedar from Syria. It is reported that Hatshepsut had these trees planted in the courts of her Deir el Bahri mortuary temple complex, Arboreta are special places for the cultivation and display of a wide variety of different kinds of trees and shrubs. Many tree collections have been claimed as the first arboretum, in most cases, Arboreta differ from pieces of woodland or plantations because they are botanically significant collections with a variety of examples rather than just a few kinds. Of course there are many tree collections that are older than the eighteenth century in different parts of the world. Loudons Arboretum et Fruticetum Britannicum,8 vols, Loudon urged that a national arboretum be created and called for arboreta and other systematic collections to be established in public parks, private gardens, country estates and other places. He regarded the Derby Arboretum as the most important landscape-gardening commission of the part of his career because it demonstrated the benefits of a public arboretum. The more lofty trees suffered from the high winds. We walked round the two spirals of this coil of trees and shrubs, viz. from Acer to Quercus. There is no garden scene about London so interesting, a plan of Loddiges arboretum was included in The Encyclopaedia of Gardening,1834 edition. One example of an early European tree collection is the Trsteno Arboretum, the date of its founding is unknown, but it was already in existence by 1492, when a 15 m span aqueduct to irrigate the arboretum was constructed, this aqueduct is still in use. A garden tool is any one of many tools made for gardens and gardening and overlaps with the range of tools made for agriculture and horticulture. Garden tools can be tools and power tools. The hand tools used by gardeners originated with the earliest agricultural implements used by humans. Examples include, Axe Sickle Pitchfork Spade Scythe Shovel Trowel Hoe Fork Rake In some places the machete may be used as a tool as well. The earliest tools were made of wood, metal, however, the development of metal working, first in copper and in iron and steel, enabled the manufacture of more durable tools. Industrial metalworking enabled the manufacture of efficient cutting tools, including pruning shears, grass shears and larger, modern tool design includes ergonomics considerations. Tools are being designed that induce ever less stress on the body when used. The most efficient tools keep the body in a position while being used. This helps to lessen the stress on joints and muscles, an advantage of this approach is that it requires gardeners to exert less energy whilst using the tools. Bedding, in horticulture, refers to the temporary planting of fast-growing plants into flower beds to create colourful, seasonal displays, during spring, summer or winter. Plants used for bedding are generally annuals, biennials or tender perennials, some bedding plants are referred to as patio plants because they are widely used in pots and other containers positioned on patios, terraces and other areas around houses. Larger tender conservatory plants may be moved out from greenhouses or conservatories and planted out in borders for the warmer months, the modern bedding plant industry breeds and produces plants with a neat, dwarf habit, which flower uniformly and reliably. 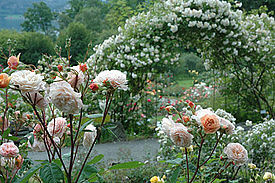 There exists a range of plants specifically grown to produce a period of flower colour throughout the spring and summer. Towns and cities are encouraged to produce impressive displays by campaigns such as Britain in bloom, plants used for spring bedding are often biennials, or hardy, but short-lived, perennials. Spring-flowering bulbs such as tulips are used, typically with forget-me-nots, winter pansies. Plants used for bedding are generally annuals or tender perennials. They become available in nurseries and garden centres during spring, to be hardened off by the purchaser. Experienced gardeners keep an eye on the weather forecasts at that time of year and are on standby to protect their bedding displays overnight with horticultural fleece if frost threatens. Carpet bedding employs two or more contrasting plant cultivars with a neat, dwarf habit and distinct colouring to create geometric displays and it is often used to form such things as lettering, logos or trademarks, coats of arms, or floral clocks. Planted in autumn to give a display until early spring, the used for winter bedding are mainly hardy perennials. As it has to be planted at the time of year as spring bedding does, winter bedding tends to be less commonly seen. Some are short-lived and will be discarded after their first display, winter-hardy ornamental vegetables such as cultivars of kale and cabbage with coloured or variegated foliage are increasingly common. Forest gardening, a plant-based food pro-system, is the worlds oldest form of gardening. 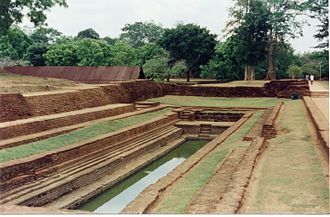 Forest gardens originated in prehistoric times along jungle-clad river banks and in the wet foothills of monsoon regions, in the gradual process of families improving their immediate environment, useful tree and vine species were identified and improved while undesirable species were eliminated. Eventually alien species were selected and incorporated into the gardens. The enclosure of outdoor space began in 10,000 BC, though no one knows the specific details of the first garden, historians imagine the first enclosure was a type of barrier for excluding animals and marauders. Garden construction and design was a precursor to landscape architecture. The modern words of garden and yard are descendants of the Old English geard, vitruvius, a Roman author and engineer, wrote the oldest extant design manual in 27 BC. De architectura libri decem addressed design theory, landscape architecture, water supply, vitruvius asserted that firmitas and venustas were the primary objectives of design. Some still consider these elements essential to quality design of landscape, after the emergence of the first civilizations, wealthy persons began to create gardens for purely aesthetic purposes. Another ancient tradition is of Persia, Darius the Great was said to have had a paradise garden, Persian gardens were designed along a central axis of symmetry. Persian influences extended to Helenic Greece after Alexander the Great, C.350 BC there were gardens at the Academy of Athens, and Theophrastus, who wrote on botany, supposedly inherited a garden from Aristotle. Epicurus had a garden where he walked and taught, and he bequeathed it to Hermarchus of Mytilene, alciphron referenced private gardens in his writing. The most influential ancient gardens in the world were those of Ptolemy in Alexandria, Egypt. Wall paintings in Pompeii, Italy attest to elaborate development, the wealthiest Romans built extensive villa gardens with water features, including fountains and rivulets, topiary and shaded arcades. Prairie Public Television is a state network of public television stations operated primarily by Prairie Public Broadcasting. It comprises all of the PBS member stations in the U. S. state of North Dakota, PPT is available on most satellite and cable television outlets. In 1959, North Central Educational Television, the organization to Prairie Public, was incorporated. On January 19,1964, KFME signed on from Fargo as North Dakotas first educational television station, the Prairie Public name was adopted in 1974, the same year the first satellite station, KGFE in Grand Forks signed on, marking the beginning of the statewide network. A year earlier, KFME had almost shut down due to lack of funding, KFME acquired a color video tape recorder in 1967, and color cameras in 1975. The FCC had allocated educational frequencies to Bismarck, Minot and Dickinson in the 1960s. While KFME was picked up on cable in Bismarck in the early 1970s and it would be 1977 before the state legislature granted Prairie Public funding to build a statewide public television network. KBME in Bismarck was established in 1979, bringing over-the-air public television to the portion of the state for the first time. KSRE in Minot followed suit in 1980 and KDSE in 1982, Prairie Public purchased the Fargo American Life Building in 1983 and moved its studios there in 1984. In 1989 KFME and cable feeds went to a 24-hour television broadcast schedule, the Prairie Satellite Network distance education state network, with 70 sites, was completed in 1994. Later, KWSE in Williston signed on in 1983, and KJRE in Ellendale/Jamestown signed on in 1992, Prairie Public became the first broadcaster in North Dakota to broadcast in high definition, with KFME-DT and KBME-DT debuting in 2002. Digital-only station KCGE-DT Crookston/Grand Forks signed on in 2003, with the rest of the Prairie Public stations broadcasting in HDTV by 2004. The transmitter for KGFE was damaged in May 2004, due to ice buildup on the tower and this caused water damage to the transmitters equipment, as well as damage to the roof of the transmitter site. A biennial plant is a flowering plant that takes two years to complete its biological lifecycle. In the first year, the plant grows leaves, usually the stem remains very short and the leaves are low to the ground, forming a rosette. Many biennials require a treatment, or vernalization, before they will flower. During the next spring or summer, the stem of the biennial plant elongates greatly and this typically makes biennial vegetables such as spinach and lettuce unusable as food. The plant flowers, producing fruits and seeds before it finally dies, there are far fewer biennials than either perennial plants or annual plants. Under extreme climatic conditions, a plant may complete its life cycle rapidly. This is quite common in vegetable or flower seedlings that were vernalized before they were planted in the ground and this behavior leads to many normally biennial plants being treated as annuals in some areas. From a gardeners perspective, a status as annual, biennial. Biennials grown for flowers, fruits, or seeds need to be grown for two years, biennials that are grown for edible leaves or roots are grown for just one year. A great house is a large house or mansion with luxurious appointments and great retinues of indoor and outdoor staff, especially those of the turn of the 20th century. Examples include the English country house and the homes of various millionaires row in some U. S. cities such as Newport, in Ireland, the term big house is usual for the houses of the Anglo-Irish ascendancy. By some reports, the homes of the wealthy at Newport averaged four servants per family member. There was often an elaborate hierarchy among staff, domestic workers in particular and it was considered déclassé to refer to ones own townhouses, estates or villas as mansions and modern etiquette books still advise that the terms house, big house or great house be used instead. As in the past, todays great houses are limited to heads of state, the International Guild of Butlers estimates that the annual salaries of a 20-25 person household staff total in excess of US$1,000,000. In countries with supplies of cheap labour, the middle classes are still able to afford household help. 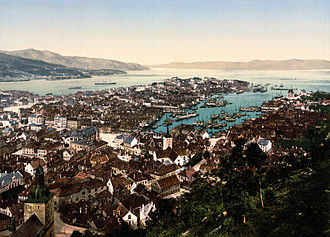 An historic photochrom of Bergen near the end of the 19th century. Visible are Bergen Cathedral (Domkirken) in the bottom left corner, Holy Cross Church in the middle, the bay (Vågen) with its many boats and the Bergenhus Fortress to the right of the opening of Vågen. 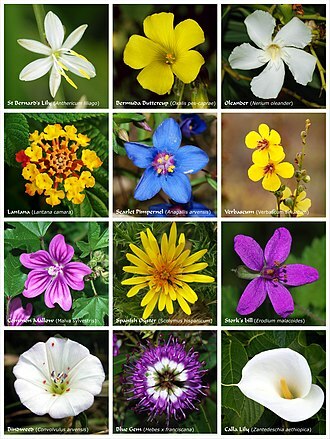 A poster with flowers or clusters of flowers produced by twelve species of flowering plants from different families. Main parts of a mature flower (Ranunculus glaberrimus). Rubber mulch nuggets in a playground. 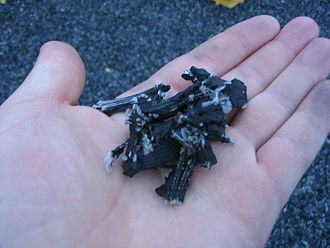 The white fibers are nylon cords, which are present in the tires from which the mulch is made. Shredded wood used as mulch. 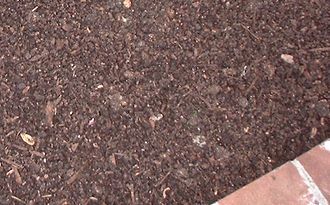 This type of mulch is often dyed to improve its appearance in the landscape. 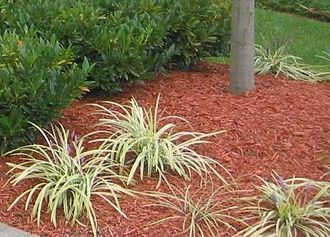 Pine needles used as mulch. Also called "pinestraw" in the southern US. Switchgrass is a deep-rooted perennial. These roots are more than 3 meters long. Looking South-South-East at the Event Pavilion from the Chinese Tulip Tree plantings at The National Arboretum Canberra. During part of the 18th century, Abney Park Cemetery was the largest arboretum in Europe. Allotment gardens in Vallila, only 2-3 km from central Helsinki. Each allotment contains a summer-cottage-type building. Strathcona Heights Community Garden in Ottawa, Canada. A 20ft x 20ft community garden plot in Harrisonburg, Virginia. Guerrilla gardening on a Los Angeles street. Guerrilla gardeners planting vegetables on previously empty space in downtown Calgary, Alberta, Canada. Adam Purple's urban garden on the Lower East Side of Manhattan in 1984. "Art at the Park" at Guerrilla Park in Welland, Ontario in 2015. An 1835 estate map of the landscaped parkland at Blenheim Palace, in Oxfordshire, England. One of most famous historical landscape architects, Lancelot "Capability" Brown (1716 - 1783). The Baroque terraced garden at Powis Castle in Wales, restored in the early 20th century and now cared for by the National Trust. Restoration work at Wrest Park. 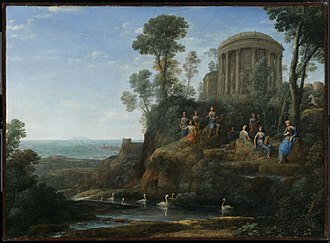 The paintings of Claude Lorrain inspired Stourhead and other English landscape gardens. Parterre at Cliveden, with restored 19th-century style planting. Shrub vegetation (with some cactus) in Webb County, Texas. The renaissance style gardens at Chateau Villandry. 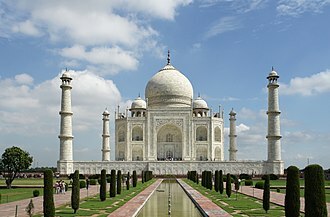 The Mughal-style garden leading to the Taj Mahal. The Xeriscape Demonstration Garden at the headquarters of Denver Water in Denver, Colorado. Cacti are one of the low-water-consuming plants used in Xeriscaping. A dandelion is a common plant all over the world, especially in Europe, Asia, and the Americas. It is a well-known example of a plant that is considered a weed in some contexts (such as lawns) but not a weed in others (such as when it is used as a vegetable or herbal medicine). 700 cattle that were killed overnight by a poisonous weed. The Knot Garden at the Red Lodge Museum, Bristol. Parsley is a common example of a biennial plant. The Sweet William Dwarf plant is a biennial plant. A collection of various garden tools. Some pruning tools that can be used to maintain a garden. The back garden of Iford Manor was designed by Harold Peto. The back garden of the Archdeacon of Canterbury contains a mulberry which is said to have been planted by Erasmus. 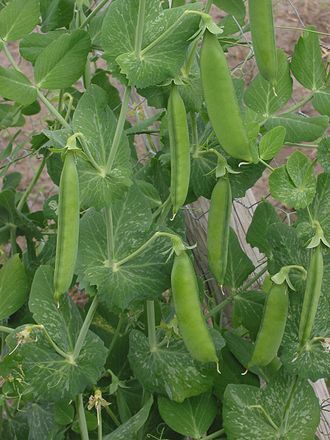 Peas are an annual plant.